This mineralogical sequence is similar to that spectrally detected on several regions on Mars (e. g. Ehlmann, 2009; Loizeau et al., 2007; Noe Dobrea et al., 2010). Data from the the Nili Fossae region illustrates this (Image 2). The Nili Fossae bedrock, detected as excavated material in crater fill, indicates an olivine-rich composition suggesting an ultramafic nature. As in Murrin Murrin, the altered materials observed form well-defined outcrops with distinct mineralogy; generally Fe/Mg smectites overlain by a kaolinite-bearing zone with probable iron oxides or hydroxides. The crater gives an upper limit to the overall thickness of the altered zone, <80 m at this location, showing that the smectites are limited in thickness to several tens of meters. Image 2: 3D view of Nili plateau (centered 22°N, 74.6°E) based on CRISM RGB map superimposed over HRSC image 1347. The mineralogy was determined by using CRISM spectral data. The vertical exaggeration is 3X. A-B: Interpretative cross section using HRSC DEM topographic profile and composition as obtained at the surface (Gaudin et al., 2011). The origin of phyllosilicates detected on Mars is still under discussion and leading hypotheses include diagenesis, hydrothermalism and weathering processes. By analogy, we propose that the mineral assemblage locally detected on Mars is the result of long-term weathering under a climate conditions that were significantly warmer than present. Colin, F., Nahon, D., Trescase, J.J., Melfi, A., 1990. Lateritic weathering of pyroxenites at Niquelandia, Goias, Brazil: The supergene behavior of nickel. Econ. Geol. 85, 1010–1023. Ehlmann, B.L. et al., 2009. 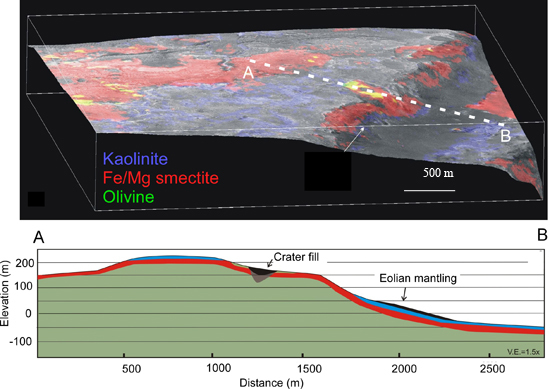 Identification of hydrated silicate minerals on Mars using MRO-CRISM: Geologic context near Nili Fossae and implications for aqueous alteration. J. Geophys. Res. 114, E00D08. doi:10.1029/2009JE003339. Gaudin, A., Decarreau, A., Noack, Y., Grauby, O., 2005. Clay mineralogy of the nickel laterite ore developed from serpentinised peridotites at Murrin Murrin, Western Australia. Aust. J. Earth Sci. 52, 231–241. Gaudin, A.; Dehouck, E. ; Mangold, N., 2011. Evidence for weathering on early Mars from a comparison with terrestrial weathering profiles, Icarus, 216, 257-268. Loizeau, D., and 10 colleagues, 2007. Phyllosilicates in the Mawrth Vallis region of Mars. J. Geophys. Res. 112, E8, E08S08, doi: 10.1029/2006JE002877. Noe Dobrea, E.Z. et al., 2010. Mineralogy and stratigraphy of phyllosilicate-bearing and dark mantling units in the greater Mawrth Vallis/west Arabia Terra area: Constraints on geological origin. J. Geophys. Res. – Planets 115, E00D19. doi:10.1029/2009JE003351. Yongue-Fouateu, R., Yemefack, M., Wouatong, A.S.L., Ndjigui, P.D., Bilong, P., 2009. Contrasted mineralogical composition of the laterite cover on serpentinites of Nkamouna-Kongo, southeast Cameroon. Clay Miner. 44, 221–237.